Most readers will know about my love of Thai snacks, especially Kanom Tokyo. Strangely these are pretty common in Melbourne but so far we haven't seen them in Bangkok. On a previous trip to Bangkok we visited a food market in Silom with my great uncle Colin and tried some cute little Thai snacks that we thought were Kanom Tokyo. As we were wanting to try them again we jumped on a ferry downriver then caught a skytrain to Silom and with a bit of luck and a bit of skill managed to find our way back to the market we had visited a few years earlier. 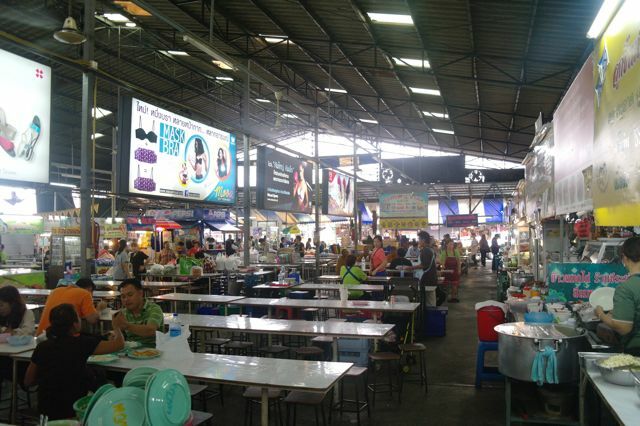 The food market is huge with probably around 100 vendors, it is where many of Silom's office workers eat their lunch. I was also hoping to try and find a Hoy Tod (Mussel Omlette) vendor that I had seen there on our last visit. Unfortunately the Hoy Tod vendor no longer operates from this market so I settled for a serve of Tod Mun Pla (fish cakes) instead. These are a great little snack that are best enjoyed doused with sriracha chilli sauce. There was so much interesting food for sale that it was actually a bit overwhelming. 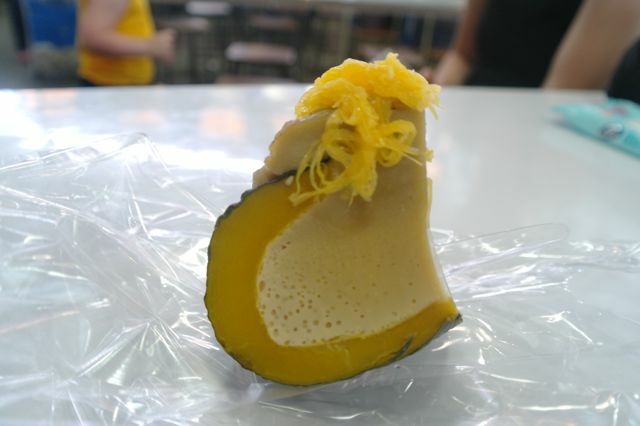 As it was too early for lunch I decided to try some Sangkaya (custard filled pumpkin). I had read about this dish but never had to chance to try it. I always find it so interesting how the Thai don't have any preconceptions as to whether a vegetable is sweet or savoury and are happy to use things like corn or pumpkin in either capacity. The creamy custard and soft sweet pumpkin is a lovely combination. At first we were a bit worried that our custard snack vendor was not there but luckily after a bit of a search Tina managed to find her. The lady was incredibly friendly and had quite good english and was able to explain to us that the snack wasn't Kanom Tokyo but in fact Doreaki named after the Japanese amine character Doremon as apparently these are his favourite snack. Basically Doreaki are little pikelet sandwiches filled with various sweet custard creams. They are lovely and soft and very delicious. A serve of 6 is around 20 baht but to be honest I don't really remember. I was too busy asking her lots of questions about where to buy the machine and how they are made. Once again we were overwhelmed by her friendliness and willingness to help us. She wrote down the address where we could buy the Doreaki machine and even offered to take us there on the weekend. I'm not 100% sure what all the creams are but of course they are all delicious! One of them is corn, I think the purple one is taro and the green one is coconut coloured with pandan but that's really just a guess. We managed to find the place that sells the machines and are now proud owners of a Doreaki machine. I am very hopeful that Doreaki will soon be available in Melbourne! We are heading back to see her before we leave to see if we can convince her to give us a lesson on how to make the batter and creams, fingers crossed! Interesting post! I have to make one correction though, as your vendor may speak English but she's still full of ขี้. Dorayaki is Japanese for "fried gong" (from the shape), and they predate Doraemon by a good 50 years. To confuse things further, what she calls "dorayaki" is actually a lot closer in apparance to Japanese imagawayaki, which is more hockey puck -shaped and a bit chewier. 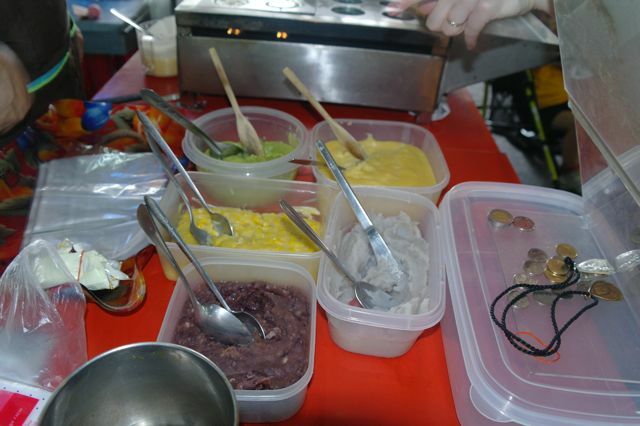 For both, the sole authentic filling is red bean (azuki) paste, seen on the lower left in your last photo. I officially love your blog, because I love my Thai Food. Thank you so much for sharing all these great posts! Definitely no Pokemon involved either, those came along 30 years later! Thankyou Peach Water, it's tough work but someone has to do it! It's very nice to get positive feedback that readers are enjoying our efforts. Anyway, gotta go. Lots more work to do! Don't get to excited you will find them at Box Hill Central already. So you can go into business against them. Thankyou for the information Anon. You must be talking about Mr Dorayaki. I will definitely be visiting Box Hill to try his Dorayaki. They look a bit different to what we tried in Silom as his seem mostly savoury with the flavours like tuna mayo and cream cheese etc. 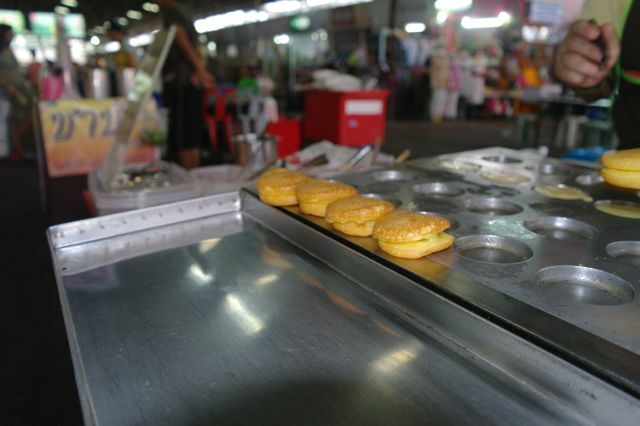 The Dorayaki we had in Silom were definitely Thai inspired and had all sweet custard fillings. I now know that this isn't the traditional Japanese way but I think its another example of Thai assimilation and adaptation of foreign food to suit the Thai taste We will definitely be going with the Thai style. I hope you keep following krapow and come and try our Dorayaki when we get up and running! 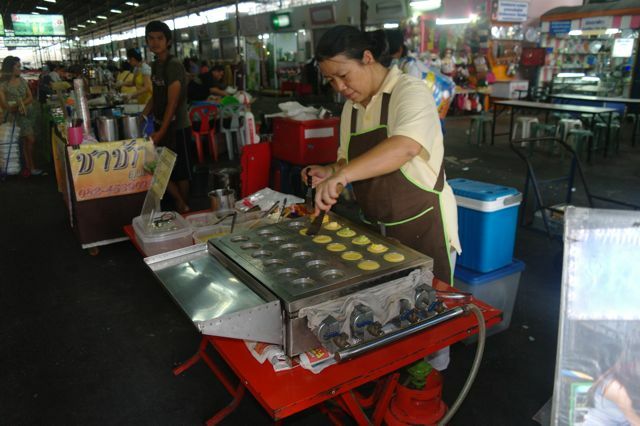 Like you, I also enjoy both the street treats and the details of life in Thailand. Thanks for this post! I ran across your blog while doing research for a post on mine about Thailand. Thankyou khunbaobao, please tell me about your blog. i love reading other people's Thai food blogs. Ahh, finding this blog has made my day. I lived in Bangkok for 2 years and, since my return, have constantly been on the search for the perfect Pad Krapow Moo or THE DUCK NOODLE SOUP - oh, how I miss thee!! Anyway, I now have an entire summers worth of new places to try! I look forward to it and look forward to slowly trawling my way through the blog!! Thanks again! !